Today is Canada Day north of the U. S. border. Celebrations are taking place from the smallest hamlet to the huge metropolitan centres. Hundreds of thousands of proud Canadians will be waving our flag. To be brutally honest, the design of our flag doesn't do a thing for me. It has been called "Pearson's Dishrag" as Lester B. Pearson was our Prime Minister when our "new" flag was introduced. Seeing the Stars and Stripes in the U. S. inspires patriotism in me like nothing else even though I'm a Canadian. 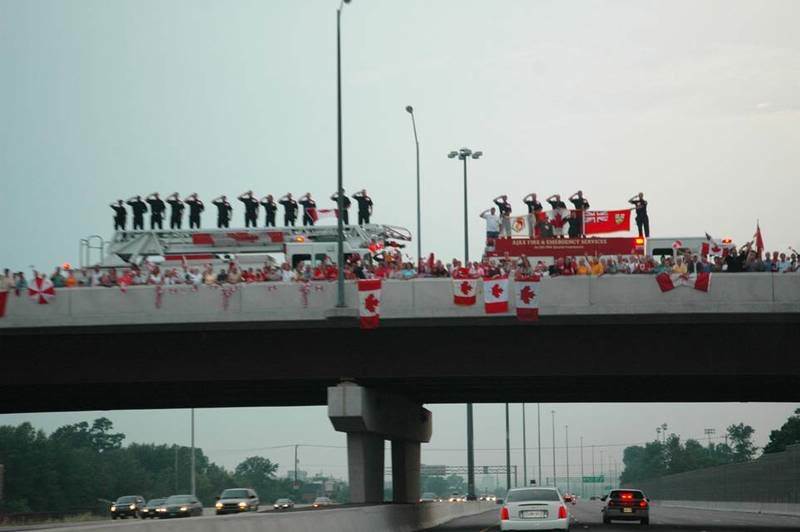 The other day as I drove home from Toronto I witnessed another celebration as thousands of sad but proud Canadians lined the overpasses on the Highway of Heroes, a stretch of Highway 401 between our Armed Forces base in Trenton, Ontario and Toronto, our province's capital city. Each time one of our Canadian troops is killed in battle, he or she is flown "home" to Trenton where a repatriation ceremony takes place. 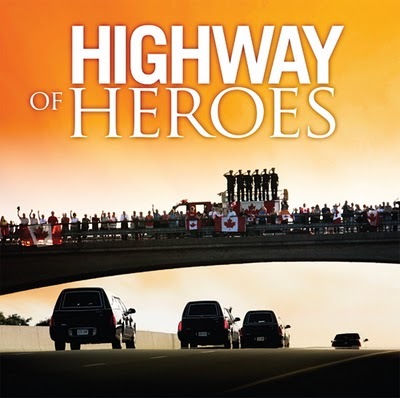 Then a motorcade of police cars, military personnel, hearses and family members travels along the Highway of Heroes to the coroner's office in Toronto. 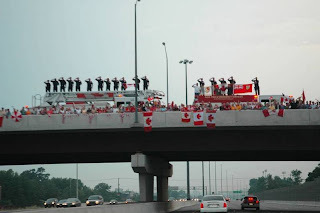 Each time I drove under an overpass (and there were dozens of them) I saw hundreds of Canadians waving flags, waiting for the motorcade to pass. There were fire engines with their lights flashing, ambulances doing the same and police cars lining the side of the highway at the overpasses. That's when our Canadian flag becomes a thing of beauty for me. It's difficult to hold back the tears as I think of family members mourning the loss of their loved ones who gave their lives to buy freedom for others. So, my friends, Happy Canada Day and wave that flag with all your might! Your flag does not remind me of a dishrag. I've always liked it ... but I've not been exposed to any history about it:) I hope your Canada Day celebrations bring good memories to you throughout the year. You live in a beautiful country .. I'm thankful to live so close to the border and have the opportunity to vacation in BC every so often. Sunday blessings to you.